Halka Nurseries is the country’s premier grower of specimen trees. They provide trees to architects and landscape contractors for government, institutional, commercial, and residential projects from coast to coast. The company was founded in 1954, and while they had a website previously, it was very outdated and static. 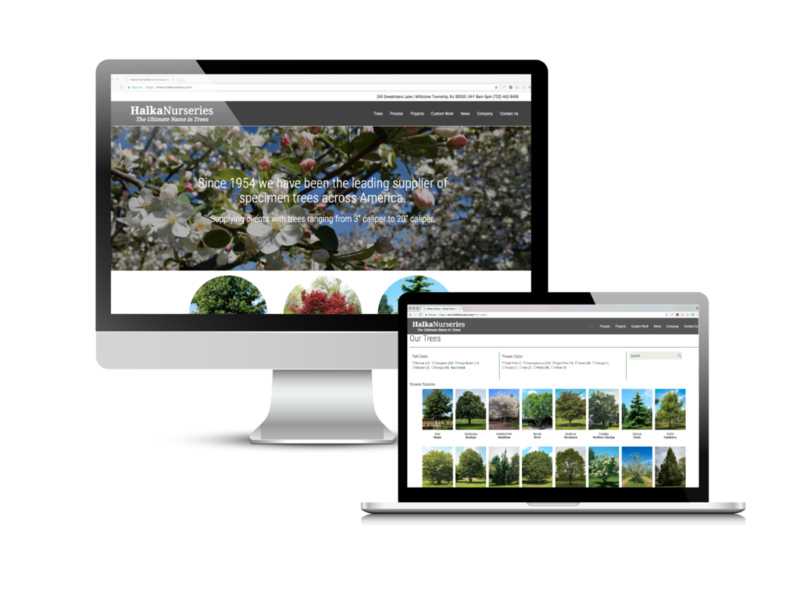 To enhance the buyer experience, Halka wanted to put detailed information about their growing and transplanting process online as well as tree species information for customer browsing. A big part of the project was the development of a detailed tree product database. Crearé Web Solutions worked with Halka’s team to identify the fields that customers might search (fall color, flower color, height, spread, shape, foliage, and hardiness zone) and built both the customer-facing pages and the behind-the-scenes database based on this information. This aspect of the website solidifies Halka’s reputation for being a knowledgeable, go-to resource for information about species that grow well in different U.S. climates. It has become much easier to maintain, update and add to the tree product database on the Halka website, enabling Halka to consistently provide the most up-to-date information and maintain their reputation as tree experts. The code has also allowed for us to easily update design pieces of the website in order to modernize the Halka brand. Thank you Brianna and Nicolas for building our website! You both do an amazing job at giving us exactly the look we are going for, and helping us to keep up with our product, since it is a moving target. Providing us with a monthly report of activity on our site is another main reason we love working with you both. Being able to see the traffic on our site from all different portals, and all times of the year makes a huge impact on our company. We receive a lot of compliments on your work. Thank you!